Without fail, nearly every new-car press release I read includes a snippet about how big the screen is. This is just the way things are now. It’s nearly impossible to get a new car without a screen. And with the way things are headed, this is the next hot piece of real estate for billions of dollars in ad and service revenue. We’re truly all hurtling to hell in the fast lane. If you think about it, those screens in our cars are pretty much the last screens in our lives that don’t feed us an endless stream of advertising. That might change, though, according to this extremely dystopian but very excellent story from the Wall Street Journal. As of right now, there is no uniformed way that automakers implement and design the operating systems for those infotaiment screens. They differ from automaker to automaker. As a result, many consumers are often confused and frustrated by the systems because they are clunky, slow and counter-intuitive. And, as the Journal points out, when you consider that these systems are generally engineered and designed years before the car hits the market and that people usually keep their cars around longer than their smartphones, automakers are at a natural disadvantage. There are a bunch of solutions to this. Some, like Ford and Daimler, attempt to create their own systems. Others have their own systems but also make them easily compatible with Android and Apple phones. On future screens, local restaurants, doctors’ offices and other services could target ads based on typical driving routes. An insurance company could offer lower rates for cautious drivers, while car makers could use system data to offer service on an aging part before it blows. Some envision a world where users could start watching a TV show at home, then with a voice command continue watching the same program in the car. Others are working on allowing users to order and pay for gasoline and coffee on their screens. “We see this as the battle for the fourth screen,” after the smartphone, computer and TV, a Silicon Valley advertising exec told the outlet. It’s already starting, too. Domino’s has an in-car infotainment app. More and more cars are connecting to Amazon’s Alexa, which we all know totally isn’t listening to you at all ever. If the revenue-chasing automakers and Silicon Valley get their way, then we’re just one step closer to living in a fog of the the fast-food and screen-laden future aboard The Axiom. Maybe! Maybe even one day cars will just be a place to put more screens. The new Ford Explorer already comes with a massive one. Mercedes-Benz’s new MBUX system is also a huge screen (which you can yell at). Honda’s retro EV is all screen inside. And Kia’s electric concept car has 21 screens. 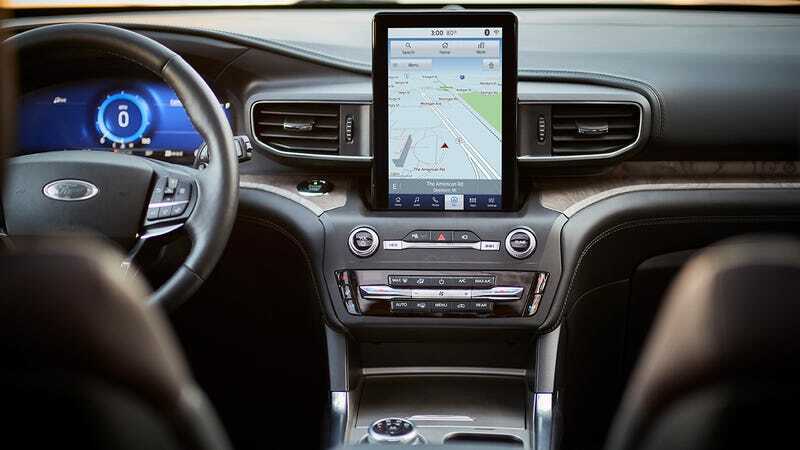 A Mazda spokeswoman said there is no easy way to turn off the infotainment system, including the radio, on older models. Mr. Cunnington is happier with his most recent purchase, a 2018 Toyota Tacoma pickup truck. Still, he studies his route before he leaves the house so he doesn’t have to rely on the vehicle’s navigation system. “I’ve heard all the stories of the navigation systems routing you to Timbuktu,” he said.